The Every Students Succeeds Act (ESSA) provided states with newfound flexibility on accountability measures and school improvement strategies. Many policy experts have analyzed states’ ESSA plans, which explain how states use their federal funds under various provisions of the new law, as well as the approaches states take to identify and rate schools and improve their performance where needed.1 And while strong accountability frameworks and school improvement plans are critical for school and student success, ensuring that all students have access to excellent educators is just as important. In fact, ensuring that all students have access to well-prepared and supported teachers undergirds all other efforts to improve student outcomes. However, not much has been written on how states plan to leverage Title II, Part A of ESSA to strengthen their teacher pipelines. The Center for American Progress has reviewed each state’s ESSA plan, searching specifically for state-led and state-supported programs that will be funded, at least in part, through Title II, Part A of ESSA—the section of the law that designates funding specifically for recruiting, preparing, and supporting teachers. And because this analysis is limited to initiatives under Title II, Part A, it is not an exhaustive list of states’ strategies to improve the educator workforce; rather this brief highlights a few noteworthy states that have proposed promising teacher pipeline initiatives that they are either starting or continuing with support from Title II, Part A of ESSA. Consistent with the TeachStrong coalition’s ESSA guidance for state actors, these states are leveraging ESSA’s flexibility to support efforts around recruiting teachers of color; improving the teacher preparation experience; providing induction and mentoring to novice teachers; increasing teacher pay; and creating or encouraging career pathways, with the goal of ensuring that all students—and especially students in low-income schools—are taught by high-quality, prepared, meaningfully supported teachers.2 The author also notes what other initiatives and actions policymakers and advocates should watch for and consider as they work to modernize and elevate the teaching profession. Across the country, states and school districts experience a critical shortage of teachers, especially in hard-to-staff subjects, such as science, technology, and math, and in hard-to-staff schools, such as those in high-poverty and rural areas. And as the student population continues to grow more racially, ethnically, and linguistically diverse, the teacher workforce remains overwhelmingly white.3 Research shows, however, that students of color benefit from having teachers with whom they share the same race or ethnicity,4 and white students benefit from having nonwhite teachers as well.5 In order to increase the number of teacher candidates of color enrolling in and graduating from teacher preparation programs, several states are developing initiatives to intentionally recruit high-achieving people of color into the teaching profession. These states are setting ambitious goals and identifying concrete strategies—such as the development of grow-your-own programs, which provide high school students with site-based teaching experiences and paraprofessionals with routes into the profession—to diversify their teacher workforce. Arkansas’ Teacher Cadets Program currently operates in 38 districts to serve 450 students and will reach an additional 21 schools and 250 students during the 2018-19 school year. In addition to this grow-your-own program, Arkansas also supports the development of residency programs; piloting a three-year program for teacher candidates in charter schools with science, technology, engineering, or math (STEM) degrees but no formal training; and working to scale up paraprofessional-to-teacher programs currently operating at three preparation programs in the state. What to watch: Arkansas is undergoing a number of other teacher pipeline reforms that include adopting a new licensure system that addresses the need to recruit and retain teachers in high-poverty schools; expanding the mentoring system; recognizing National Board-certified teachers through the licensure and compensation systems; and supporting districts implementing the Opportunity Culture model.7 Under the Opportunity Culture model, master teachers, called multiclassroom leaders, are paid additional compensation to take on hybrid roles that allow them to split their time between training novice teachers and leading their own classroom of students.8 As described in a recent study, students of Opportunity Culture’s multiclassroom leaders in North Carolina schools demonstrated statistically significant academic gains in both reading and math.9 As many of these changes begin or continue to take place, education stakeholders should examine the extent to which all of these changes are aligned with one another as well as with existing programs and initiatives. What to know: The Mississippi Department of Education’s (MDE) plan stands out for aligning its teacher recruitment and retention efforts with its ambitious goals for increasing student academic achievement by 2025 and clearly stating its role in supporting districts to address equity concerns.10 The MDE recognizes that in order to reach its stated goals—which include a proposed graduation rate of 90 percent for all students by 2025—they must also support districts in recruiting and retaining teachers of color who are prepared to improve student outcomes. The MDE asserts that improvements to the teaching pipeline will simultaneously help the state attract and retain minority teachers and increase student achievement. The plan presents extensive state data, oft-cited research, and clearly stated intentions around state-level support for districts creating and implementing grow-your-own programs and career pathways as recruitment and retention strategies. While other state plans cite similar strategies, Mississippi’s plan is clearer in its vision, goals, and purpose, as it relates to district support. What to know: The Tennessee Department of Education (TDOE) is leveraging federal and state funding, including Title II, Part A funds, to implement several strategies to address critical shortage areas and the lack of teacher diversity in its urban districts. Such strategies include teacher and principal residency programs; differentiated pay plans; human capital data reports; and targeted recruitment efforts using sophisticated web-based systems and focusing on the challenge of recruiting and retaining diverse teachers. More specifically, using Title II, Part A funds, Tennessee will provide Diversity Innovation Planning Grants to local educational agencies (LEAs) for the purpose of developing and implementing recruitment plans that intentionally work to diversify the teacher pipelines. The TDOE will also publish human capital data reports, which are designed to improve efforts around recruitment, retention, preparation, placement, professional learning, and evaluation through the analysis of trends using evaluation data. The TDOE has also made its web-based recruitment portal available to all LEAs in order to provide more streamlined sharing of teacher candidate information and to elicit more thoughtful hiring practices. What to know: In 2011, and in partnership with the New Teacher Center, the Hawaii Department of Education (HIDOE) established the Hawaii Teacher Induction Center along with Hawaii Teacher Induction Program Standards. HIDOE envisions a system in which every beginning teacher participates in a three-year comprehensive induction program that includes aligned, job-embedded professional development. The induction program includes training with an instructional mentor for one to two hours per week; a professional growth plan with that mentor; and postobservation feedback and lesson-planning support. The teacher induction survey, administered by HIDOE each year, shows that the induction program has had a positive effect on teacher retention since the implementation of the Program Standards in 2011. What to watch: HIDOE intends to expand the efforts of the Teacher Induction Center to better support teachers serving special education students, English language learners, and students in the Hawaiian Language Immersion Program.19 Stakeholders and policymakers should consider how to expand and improve the induction program’s services to reach all of Hawaii’s teachers and then study the effect on various student populations. What to know: The Louisiana Department of Education launched the nationally recognized Believe and Prepare Educator Grant Program in 2014, with the goal of strengthening the supports for teacher candidates through preservice preparation. The pilot program provided more than $4.89 million in grant funds to school systems to support closer partnerships between preparation providers and school system leaders to offer aspiring teachers a full year of practice under an expert mentor and a competency-based program design.22 As of August 2017, more than 1,200 new teachers serving 26,000 students across the state have participated in yearlong residencies under the guidance of expert mentor teachers through the program.23 In addition to building a stronger cohort of new teachers, the Believe and Prepare program strategically directs resources for the program by focusing on high-need subject areas and hard-to-staff positions, such as special education, as well as rural school systems, especially through the department’s five-year, $66.8 million Teacher Incentive Fund federal grant.24 Louisiana’s ESSA plan describes how federal funds will be used to continue to support this program. Licensure and certification for teachers can be a confusing and unwieldy process—with different requirements for each state and various mandated fill-in the-bubble tests that often set the bar for passing shockingly low.29 In addition, licensure requirements may not be aligned with other aspects of the teacher pipeline, such as the new teacher experience and career advancement opportunities, and the tests do not fully capture aspiring teachers’ readiness to teach. In fact, licensure tests are weakly correlated to how a teacher will perform in the classroom. 30 In other words, licensure tests too often operate as a bureaucratic hurdle rather than a meaningful measure of teaching ability. In order to make this process more efficient and useful, licensure and certification should fit into the larger picture of a more modernized profession and include a performance assessment, in addition to exams that assess content and subject matter knowledge. What to know: In 2014, Georgia adopted a four-tiered certification structure aligned with opportunities that allow teachers to lead their peers in professional growth while remaining in the classroom.31 New teachers are either at the “pre-service” or “induction” level, while more experienced educators have “professional” and then “advanced” licenses or “lead professional” licenses.32 Expert teachers at the “lead professional” certification level are offered instructional leadership opportunities through mentoring and coaching roles. As such, the mentoring and induction roles are also built into the certification model. In sum, Georgia’s certification structure provides a foundation for career advancement opportunities and is aligned with the induction and mentoring experience. What to watch: While Georgia’s systems for certification, mentoring, and career pathways are aligned, the state’s ESSA plan does not indicate that these roles are tied to compensation structures. In other words, “lead professionals” who serve as mentors or coaches are not necessarily compensated commensurately for these roles.33 Georgia policymakers and other education stakeholders should work together to align their four-tiered system to professionalized compensation structures in order to create a more comprehensive, professionalized system that addresses several components of the pipeline. What to know: Massachusetts will use Title II, Part A funds to support its education preparation program completion and licensure requirements. Massachusetts has long been regarded as setting a high bar for licensure, with the goal of ensuring that new teachers are prepared to teach the moment they enter the classroom. In the spirit of that goal and in an effort to hold educator preparation program providers accountable for their graduates’ performance, Massachusetts will now require teacher candidates to complete the Candidate Assessment of Performance (CAP) as a condition of program completion.34 According to Massachusetts’ ESSA plan, CAP will include a component that gauges each teacher candidate’s ability to work with students from diverse backgrounds and needs. What to watch: Massachusetts revised its induction and mentoring guidelines to assist districts in creating their own programs and aligning them with other initiatives, such as the licensure framework. Massachusetts collects data on these programs and publishes a report detailing best practices and lessons learned.35 Stakeholders instituting or considering such reforms should study these reports to identify how to link preservice requirements, licensure, and new teacher supports such as induction and mentoring programs. Despite teachers’ critical role in cultivating the nation’s future workforce and affecting student outcomes,36 teachers are not paid nearly at the level of similarly educated professionals. The average starting teacher salary still hovers under $40,000 and the median base teacher salary sits at approximately $47,400,37 meaning teachers make a staggering 60 percent less than other full-time professionals with college degrees.38 Like other professionals, teachers should earn a salary commensurate with their skillset, responsibilities, and level of education. Some districts and states have moved toward professionalized pay systems while others are using loan forgiveness programs to attract and retain high-quality teachers, especially in hard-to-staff schools and subjects. Indeed, increasing teacher pay and providing other financial incentives for teachers is crucial to keeping them in the classroom, especially those in high-poverty schools. What to watch: Since the program was implemented in 2006, 63 percent of all AETP loan recipients have been certified with an endorsement in a shortage area identified by the state. However, data regarding the retention rates among loan recipients were not provided in the state’s ESSA plan.40 Nebraska officials should study and publish these data and make these findings available to policymakers and education stakeholders, particularly those seeking to implement a similar program in other states experiencing similar retention issues. One of the most significant outcomes of the era of testing and accountability in federal education policy that followed the passage of No Child Left Behind in 2002 was the collection of new data that emphasized achievement levels among students of color and students from low-income families.45 Former President Barack Obama’s Department of Education continued this legacy but also focused on teachers as a key unit of change—a controversial move, to be sure, but one that encouraged new levels of data collection on teacher preparation programs; the recruitment and retention of teachers in high-poverty schools; and teacher performance.46 Now, through ESSA, states and school districts are leveraging these data to create and improve integrated systems that allow them to make better hiring decisions, monitor students’ equitable access to effective teachers, assess teacher preparation practices, and provide meaningful professional development. What to know: The D.C. Office of the State Superintendent of Education (OSSE) has launched a collaborative to inform school staffing trends and to use data to make better hiring decisions. The D.C. Staffing Data Collaborative is a partnership between a third-party expert and 52 LEAs, serving more than 90 percent of all public schools in Washington, D.C. Through the collaborative, LEAs can examine staffing data that capture metrics in the areas of recruitment, retention, preparation, professional learning, and evaluation. Participating LEAs can use this tool to identify turnover trends and shortage areas; examine which schools lack access to effective teachers; determine where to direct more intentional recruitment resources; and study the degree to which professional learning experiences are tied to improvements in effectiveness. What to watch: While the IDOE’s theory of action represents a promising vision for teacher pipeline reform in the state of Indiana, policymakers should consider what other supports districts may need as they implement new systems to better support their teachers. For example, as districts create and implement career pathway systems, the IDOE may need to advise districts on how to compensate teachers who take on leadership roles with additional responsibilities and provide additional funding for this purpose. What to know: Oklahoma’s teacher shortage has far-reaching implications for the state’s entire education system, as stakeholders in the state have long recognized. As Oklahoma continues to lose its teachers to surrounding higher-paying states, students see a revolving door of educators entering and leaving their school—a process that research shows hurts student achievement.56 Instead of loosening requirements for entry into the profession to solve this problem, the Oklahoma State Department of Education (OSDE) assembled a Teacher Shortage Task Force to implement changes that would strengthen the teacher pipeline, thereby bolstering recruitment and retention efforts in the state. The task force “aggressively addressed strategies to recruit, retain and reward educators,” recording their recommendations in a full report provided in the appendices of the OSDE’s ESSA plan.57 Using Title II, Part A funds, the OSDE will also continue to implement Learning Forward’s Standards for Professional Learning; emphasize professional growth and ownership of feedback within the evaluation system; strengthen the residency experience, which includes induction and mentorship; and oversee the implementation of the teacher leadership model, which is codified in state law to recognize and compensate mentor and lead teachers. The Pennsylvania Department of Education (PDE) recognizes that elevating the teaching profession does not begin and end with recruitment efforts. Getting teachers in the door is just one component of a larger cycle; teachers must have meaningful supports throughout their entire career, just like other similarly educated professionals. 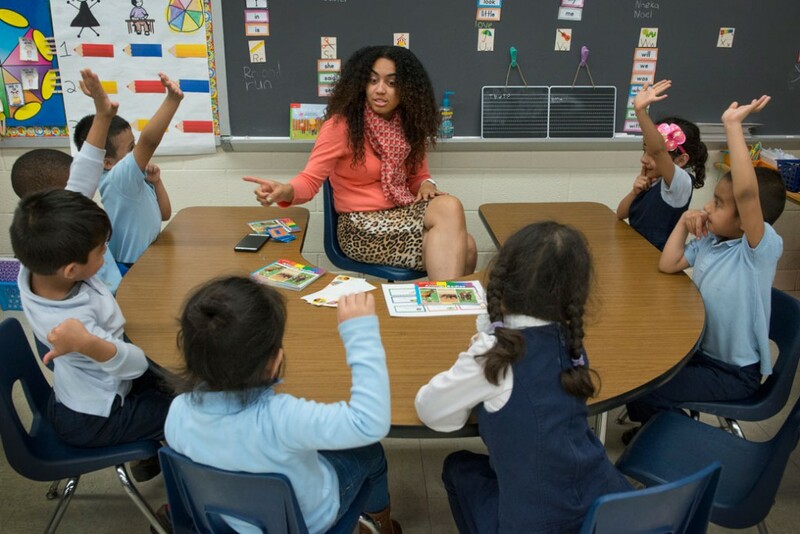 By recognizing the value of the educator workforce and dedicating funding toward improving the entire career continuum, the PDE is setting in motion a virtuous cycle whereby teachers want to enter and remain in the profession—inspiring the next generation of prospective teachers to do the same. The states highlighted in this brief have not only proposed promising teacher pipeline initiatives that will positively affect their teachers, but in doing so, they have also provided guidance for the states that are just beginning this important work. These states’ ESSA plans indicate that they will use Title II, Part A not just for professional development—the use of funds mostly commonly associated with this section of the law—but to build stronger teacher pipelines through changes to recruitment, preparation, compensation, induction, mentoring, and leadership opportunities as well. Through their ESSA plans, they have also demonstrated just how critical Title II, Part A funding is for ensuring that states are equipped to support districts and schools in their efforts to provide all students with access to excellent educators. Indeed, in order to improve student achievement—particularly among historically disadvantaged student populations—states must implement changes to modernize and elevate the teacher workforce, and they must have the resources to sustain those initiatives. Thus, as the federal government continues to review and approve states’ plans and states begin to implement their new accountability frameworks and school improvement strategies, they must work together to remember the teachers standing in front of our nation’s classrooms—for they are critical to all of these other efforts and, ultimately, will have the most impact on their students’ learning. Stephenie Johnson is the associate campaign director for K-12 Education Policy at the Center for American Progress. Thanks to Erin Garratt and Margery Yeager at Chiefs for Change, Saroja Warner at the Council of Chief State School Officers, and their many members who contributed to this brief through peer review and feedback.